Formerly called "La Xelaju" and probably my favorite restaurant in New York City when rudely pressed to choose just one, with so many delicious and very simple options and a great environment that effectively puts you in Central America. I am always giddy upon thoughts of the excellent food at this restaurant. Since first bite, it has been a love affair. Another restaurant that proves eating economically is always the way to go, the best foods are almost always in the least decorated places. If the energies are concentrated in the kitchen, we are happy and prices stay lower. This being said, there had to be a reassuring voice as we drove up to the restaurant and the first-timers among the group became skeptical with "that's it?" faces. 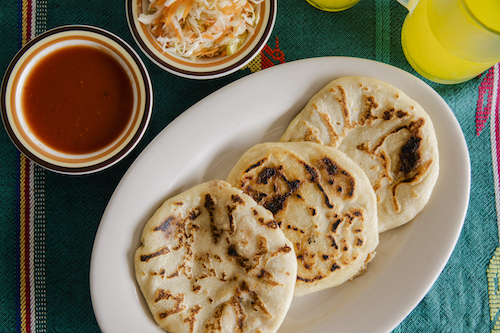 After moving one wobbly table up to another to accommodate the group, we ordered some of the Salvadoran pupusas (above) for a starter, but stuck exclusively to the Guatemalan fare afterwards. Amongst other food-sharers, the treasures of the menu are opened up and we were all able to try 6 things. Jocón. Photo by Sasha Maslov. Salpicón. Photo by Sasha Maslov. Noteworthy are the three staples of any visit to this place: hilachas ($11, below), jocón ($10, above top), and salpicón ($11, above). It's easy to point at things on the menu, and for 50% of the items there are minimal English descriptions, but a knowledge of Spanish is definitely useful here to really test your gastronomical limits, which we decided to do with the revolcado, which a brief Spanish description translated to "chopped cow heart in brown sauce." Without knowing any better, this dish could have been mistaken as tender beef, and was probably the least interesting of all of our selections. Hilachas for one on a return visit. 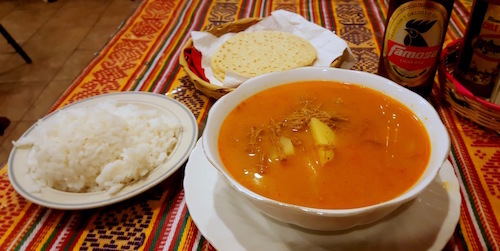 Hilachas and jocón are Guatemalan "home cooking" at it's finest, satisfying all five of us on this foggy, misty-cold evening. They are half stews, served with rice, but thick enough to stand alone. 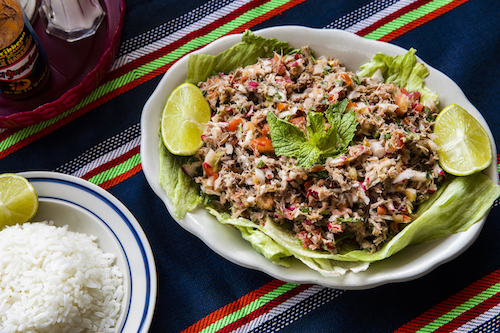 The jocón is probably the most exotic of anything we ordered, but is simply a medium-spicy green sauce with tomatillos and laced with healthy portions of chiles and cilantro. This restaurant is safe even for timid eaters, and the hilachas, a shredded beef in thick, hearty gravy will satisfy 99% of carnivores, we are sure. 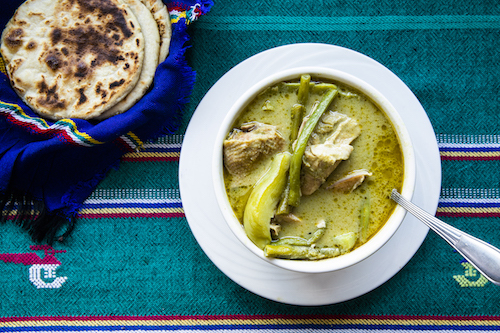 They are both the type of dish that are served at home more than a restaurant, and on a trip to Guatemala some years ago we were continually disappointed never to find them on a menu throughout the country. Surely they exist, but our inquiries led us all to the same answer: our mothers cook that! On our next trip, we will have to find some way to get invited into many houses, to see how the dish is cooked differently by each chef.